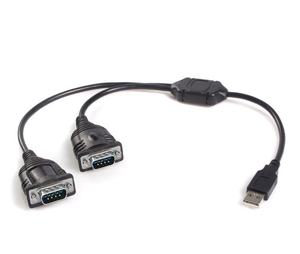 Dual port RS232 Serial to USB adapter for RS232 data conversion. 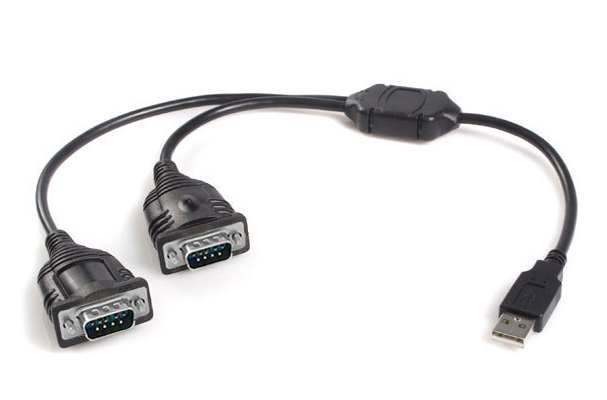 This is a convenient dual port USB to serial adapter; it features two high-speed serial RS232 ports which, once the drivers are installed, both will show up in your operating system's Device Manager as a two virtual COM ports each with its own COM port number, which can be used as if they were actual built-in COM ports. The adapter circuitry is designed with the Prolific PL2303-TA chipset, which is a good allround processor which ensures compatibility with the majority of serial devices and most current operating systems. Once the drivers are installed this adapter works as a Plug'n'Play device, simply connect it to your USB port and its ready to use. This USB to serial adapter has protection against static electricity for up to 15KV which is sufficient for most general commercial, laboratory and consumer projects; however for industrial projects and very sensitive applications we recommend using an optically isolated USB to serial adapter to protect your devices and data against damage from high-voltage spikes.